Climate can be defined as the prevailing weather conditions in a given region averaged over many years. Rainfall and temperature are the primary factors that usually limit an ecosystem’s structure and function. Secondary limiting factors include long-term climate patterns: the length and intensity of weather events, seasons in which they occur, and the amount of variability between and among years. Together, these dynamics greatly influence the types of plant species that occur, and where, the ways in which nutrients are cycled, and the relationships between soil, plants, and water availability. Accordingly, climate is a fundamental determinant of plant and animal distributions, productivity, and ultimately biodiversity. They can also affect the susceptibility of an ecosystem to disturbance. Our climate results from a combination of factors. The Hadley cell contributes to the formation of deserts all around the world. As you can see in this map, the Chihuahuan desert is located in the same latitudes as most other deserts of the world. Map of the Chihuahuan Desert showing surrounding mountain ranges. Westerly winds persist over the Chihuahuan Desert for more than two-thirds of the year. During these periods, incoming air must pass over the Sierra Madre Occidental mountains. 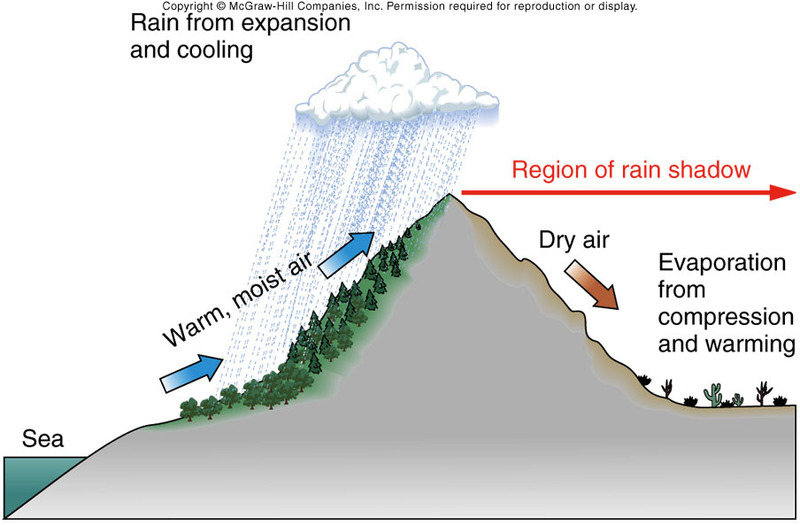 When high mountains block the path of incoming moist air, the air is forced upwards, causing it to cool and release most of its moisture. Once past the summit, the air descends the lee side of the range and grows warmer. 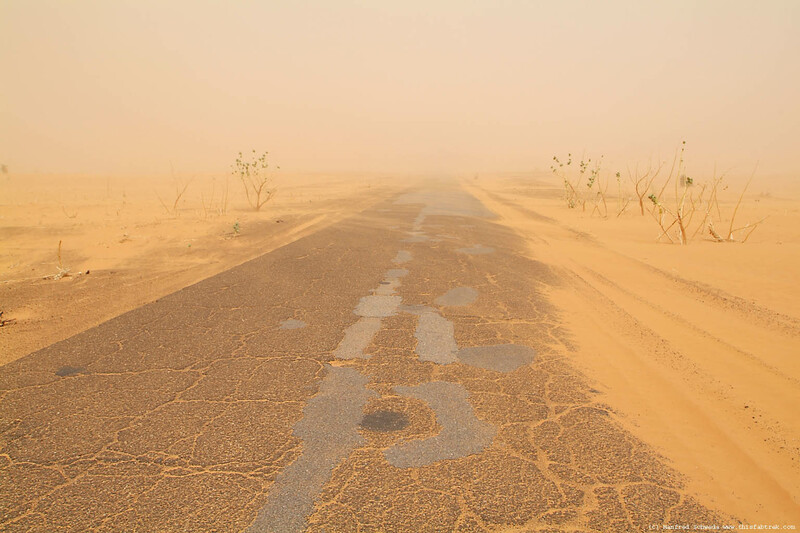 The warm dry air has great evaporative power, so that even existing surface water may be subject to high rates of evaporation. While the windward side of the range may be cloaked with well-watered forests, the leeward side, robbed of its moisture, becomes a desert. The effect is known as the “rain-shadow” effect. The Chihuahuan desert is widely described as a rain-shadow desert. To the north, the sierras become more fragmented, but the desert is farther from the sources of moisture. Land that is close to the sea generally receives more moisture than areas far inland. For example, Galveston gets about 42 inches of rain a year. Sonora, located 340 miles further inland receives about 22 inches. Pecos, 500 miles away from the coast receives 11 inches annually. As West Texans are well aware, most moisture coming from the gulf is dropped as rain long before it arrives in the Trans-Pecos. Also, the lack of continuous barriers to the north results in more intense and frequent exposure to cold, dry, arctic air. Subtropical High Pressure Cells – There is a strong relation between the occurrence of the temperature maximum shift and the onset of the summer rainy season. The highest monthly temperatures in central Mexico occur in May. By June, the heat wave moves over the southern two-thirds of the Chihuahuan Desert, and in July the northern and far-eastern portions of this arid zone achieve their maximum temperatures. The heat wave is caused by a warm upper-level high pressure cell that rotates slowly clockwise. In the months of July and August the cell shifts westward bringing moist air from the Gulf of Mexico into the Chihuahuan Desert. The influx of moist tropical air is accompanied by higher relative humidity, increased cloud cover, and thunderstorms. The increased cloud cover and widely scattered convection storms cool the area and bring about the conditions West Texans refer to as the “Fifth Season.” West Texas receives between 50 and 75 percent of its annual rainfall during this period. Because most of the Chihuahuan Desert is in the lee of the Sierra Madre Occidental and other mountain ranges to the west and north, and is located more towards the equator, this arid zone does not have a winter rainy season like that of the northern Sonora and the Arizona Uplands. Their rains are equally distributed in the Spring and Fall. Our peak rainfall occurs between July and October. Our winter rainy season is a period of prolonged cloudiness and light precipitation usually in the form of drizzle. The winter season reaches peak rainfall between November and February. This seasonality of precipitation is the major distinction between the warm deserts of North America. Low Pressure Cells – Low-pressure systems can also bring rain. Years with unusually generous rainfall are frequently associated with a special tropospheric circulation associated with a Southwest cutoff low-pressure system. These lows are counter-clockwise rotations which have become separated from the main belt of west-to-east winds in the jet stream high above the earth’s surface. They usually form over the southwestern United States, adjoining Mexico, and the adjacent Pacific Ocean. Generally cutoff lows remain in the area for several days – then they move northeastward and intensify. The counter-clockwise circulation around this low pressure center results in a southerly influx of moisture from the Pacific Ocean. Tropical Revolving Storms – Tropical storms can bring in moisture from great distances. The Gulf of California is a major source of summer moisture for northwestern Mexico and the adjoining southwestern United States. Powerful storms in both the Gulf of Mexico and in the tropical eastern Pacific Ocean are responsible for most of the heaviest and widespread rains occurring in the interior desert. These storms are also responsible for most of the large deviations in precipitation totals from year to year, especially those deviations occurring during the warm season. Hurricanes often bring huge bursts of rainfall over short periods. In fact, floods are common throughout the northern Chihuahuan Desert. Recent examples in West Texas might include the Sanderson flood in 1965, caused by almost a year’s worth of rain falling in 12 hours on the canyons around Sanderson Texas. The resulting flood killed 28 people – their bodies were found as far as 200 miles away. Twenty percent of the population was left homeless and half of all business was destroyed. More recently, flash floods claimed the lives of at least 34 people in northern Mexico and 6 people in Texas between April 3 and April 7, 2004. In 2008 flood waters breached levees around Ojinaga and Presidio. The CD experiences a drought on an average of once per decade. The written record goes back to Cabeza de Vaca who was petitioned by farmers near Presidio to ask the sky gods for rain. In 1720 a serious drought spread throughout the northern CD causing massive livestock die-outs. In 1883 Texas opened its western school lands to immigration, attracting thousands of immigrant farmers and would-be ranchers to the West. The timing was singularly unfortunate because one of the worst droughts in Texas history started in 1884 and did not break for two years. Most of the new immigrants failed and had to return to the East. Between 1892 and 1992 the Trans Pecos experienced 16 years of drought. The most catastrophic one affected every part of the state in the first two thirds of the 1950s. It began in the late spring of 1949 in the lower valley, affected the western portions of the state by fall, and covered nearly all Texas by the summer of 1951. For seven consecutive years, 1950–1956, annual precipitation was less than 12 inches. In three of those years (1951, 1953, 1956) the annual value was less than 9 inches, an amount lower than any year in the half century since then. In the Trans-Pecos only 8 inches of rain fell the entire year of 1953, and the drought grew worse from 1954 to 1956. Streams only trickled or dried up completely. The drought ended abruptly in 1956. Although the 1950s drought was unique in the 20th century, it was neither as severe, or as long as droughts that happened in the area around 1000 A.D. and in the late 13th and 16th centuries. Frequency analysis indicates that severe droughts occur at least once every century with an approximate average of 60–80 years between them. This periodicity is observed in similar records throughout the Mountain West. Recently, the year 2011 was the driest (and second-hottest) year on record in the state. Only 2.53 inches of rain fell at Panther Junction in the Big Bend National Park and barely over 1.5 in Presidio that year. The drought extended throughout the Big Bend into northern Mexico and caused widespread plant mortality. Texas lost 5.6 million urban shade trees, roughly 10 percent of the state’s urban forests. Probably around 500 million rural, park, and forest trees died, and the die-off will probably continue as many trees were stressed beyond recovery. 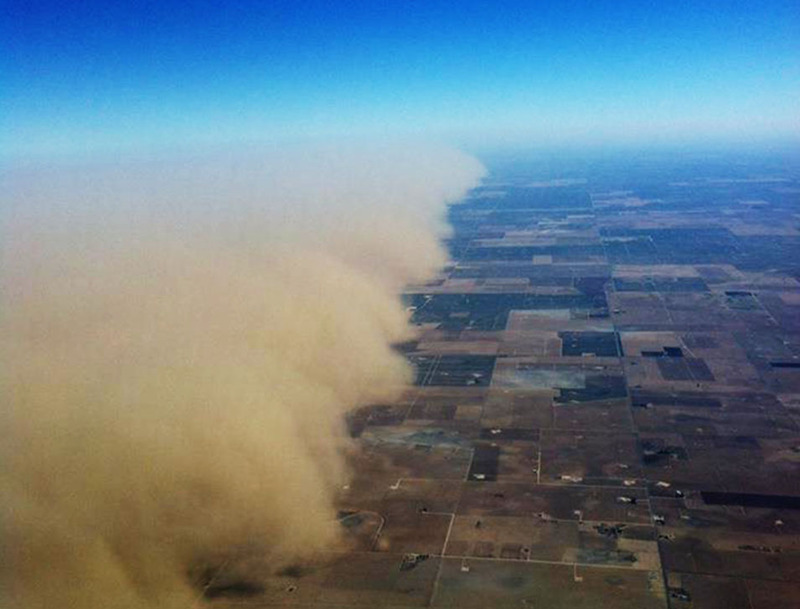 With drought, comes dust – huge dust storms traverse the CD, frequently making national and international news. Many are so large they are clearly visible from space. These storms may bring “walls” of dust over 2 miles high and along a front 50 miles wide that can move at speeds over 70 mph. The dust may be thick enough to completely darken the sky. Dust is so common around El Paso that highways are equipped with electric signs to warn of impending blowing dust and of sand drifting over the highways. Almost every aspect of the Chihuahuan desert is characterized by extremely variable conditions at all scales. Our climate is no exception. Because of our varied topography, our most dramatic local variable is probably altitude. For example, Balmorhea’s (elevation 3205 feet) average annual mean temperature is about 65°F, while only a short distance to the southwest the station at Mount Locke (elevation 6790 feet) shows a value of about 57°. Moving farther south, Presidio, at 2600 feet elevation and only about 60 miles south of Marfa shows an annual mean temperature of about 70°, but the 7730 feet high Chinati Mountains, though only 25 miles away from Presidio is about 60°. Rainfall varies extremely from year to year – in 2011 we received about 2.5 inches of rain. In 1984 we got almost 20. 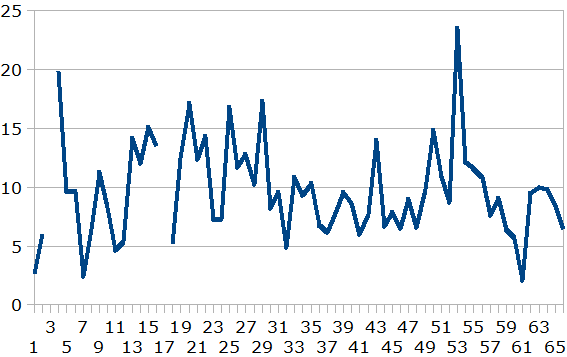 The following graph show Presidio’s annual rainfall from 1901 to 1965. The combination of clear skies, high altitudes, and southerly location enable the Trans-Pecos to receive the highest mean annual solar radiation of any location within the United States. At lower elevations in the Rio Grande valley below Candelaria some of the highest temperatures in the United States are frequently recorded. But in general, the Trans-Pecos enjoys some of the highest average maximum temperatures found in Texas during the winter (second only to the Gulf Coast) and some of the lowest average temperatures in summer (second only to the Panhandle). Of course, temperatures vary widely throughout the typical day, but on average, the Chihuahuan Desert climate is enviably pleasant for most of the year. Note: This entry is not completely finished. I’m teaching a class this fall on Chihuahuan Desert ecology, and this will be the supporting text. I’m not a climatologist, so if you notice anything amiss, anything at all, please let me know. I don’t want to misinform or mislead students. Thanks for your help. Aside | This entry was posted in General Topics. Bookmark the permalink. Thanks for this link. Lots of interesting material there. After I initially left a comment I seem to have clicked the -Notify me when new comments are added- checkbox and now each time a comment is added I get 4 emails with the exact same comment. Good grief! I don’t know for sure, but if you unsubscribed maybe the problem would go away. I really don’t understand much about how WordPress works. Sorry. Fibonacci numbers. What a wondrous subject. We were assigned a basic design project in the School of Architecture at UT Austin using golden mean rectangles and squares. All to fit within a 12″ square mat board painted in warm colors, a second geometric composition painted in warm tones, and a third and different composition to be painted in a combination of both warm and cool colors. It is obvious that we literally scratched the surface of a rich subject that nave mor to do with intuitively fine design. Thanks for the eye opener. Love reading your blogs, Gary, I always manage to learn something. Thanks. thanks for the info. I am fascinated with this area of Texas…. This is some good information and should make for an interesting class. I’m familiar with the map you are showing, and some other versions of what makes up the Chihuahuan Desert from viewpoints of plants, climate, etc. A few good, a few really weak. To me, there is little consistent, deep study or mapping of what is such a large, important part of the world. I look forward to re-reading your post, and I’ll try to make notes of anything I see and get those to you. gis guy to make one.